I originally wrote this article for Tehran Bureau. Two suicide bombers killed at least 30 people and injured 55 in a mourning procession in Chabahar on Wednesday morning, according to news reports in Iran. The Jundullah armed group, which was designated by the U.S. as a foreign terrorist organization in November, took responsibility for the attack in a statement posted to the Internet today.The group published photos of two young men wearing explosives vests and purported to be the suicide bombers, who were identified as Seifolrahman Chabahari and Hessan Khashi. 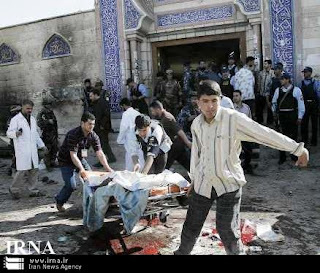 (This blog will not post the photos glorifying the suicide bombers) The statement said that the attack had been carried out to avenge the Islamic Republic's execution of Jundullah's leader, Abdol Malek Rigi, in June of this year. Information from official sources was confusing, at times contradictory, in the immediate aftermath of the bloody attacks which took place between Farmandari Square and Imam Hossein mosque in this balmy port with a free-trade zone on the Gulf of Oman. Chabahar is situated in the southern fringes of Sistan-va-Baluchistan province which has a large Sunni Muslim population and has been the scene of terrorist attacks by the Jundullah armed group which proclaims that the country's majority Shiites persecute Sunnis. The Interior Ministry was prompt in blaming foreign governments, particularly the U.S. 'The equipment and logistical support of the terrorists indicate that these elements were backed by advanced intelligence services of the region and the United States,' said a statement. The head of the country's Red Crescent and emergency services, Mahmoud Mozaffar, declared that 36 people had perished, before revising the figure to 31. Some injured victims who were subsequently revived had been counted among the dead, according to Mozaffar. Mohammad Yaghoub Jadgal, the parliamentary representative from Chabahar, told the state news agency IRNA that 50 to 60 injured had been transferred to hospitals. Witnesses spoke of two explosions in front of Imam Hossein Mosque on Imam Boulevard that cuts the city in two, along an east-west axis. The city's predominantly Sunni population worships at the much larger Jameh Mosque, a few blocks to the east. 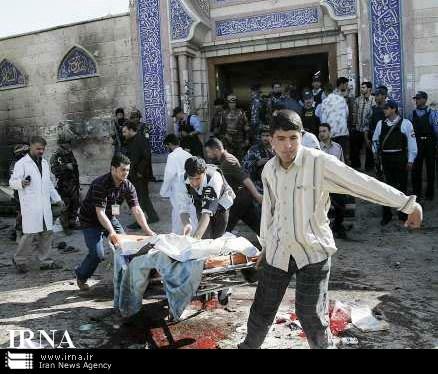 The attacks came on one of the holiest days, Tasoua, of one of the holiest months, Moharram, of the Shiite calendar. The first ten days of Moharram are devoted to mourning the martyrdom of Imam Hossein, one of the most revered figures in the Shiite faith, culminating in the commemoration of Ashura tomorrow. Today's attack took place in the official mourning procession of fishery workers and their families, according to Mehr News. Deputy Interior Minister in charge of security Ali Abdollahi told reporters that two bombs went off in close proximity between 10:00 and 10:30 AM, but subsequent news releases said that one of the two blasts was an acoustic bomb. It now appears that the latter conflagration was from the detonator of a second explosive device that did not go off. Local intelligence and security sources informed Mehr News that three assailants had been involved and that the 'main instigator' had been arrested, while another had been killed when his explosives vest blew up. Mehr News reported that the third individual had been shot by the police. Chabahar Governor Ali Bateni denied that three men were responsible for the attacks, but he confirmed that the 'main element in the terrorist attack' has been arrested. Opposition groups have announced that they will participate in tomorrow's Ashura ceremonies. Last year's ceremonies turned into a bloody protest against the regime, during which security forces killed demonstrators, at least in two documented instances by running over them with police vehicles. It is unclear whether today's blasts will result in tougher security measures tomorrow. Mahmoud Ahmadinejad has unceremoniously replaced Manouchehr Mottaki, the longtime foreign minister of the Islamic Republic, with the head of the country's Atomic Energy Agency, Ali Akbar Salehi, according to a terse statement posted to the presidency's site early Monday afternoon. Salehi was named the caretaker of the ministry as any change to the cabinet must be confirmed by the legislature before it becomes official. Article 135 of the constitution allows the president to name a caretaker minister for a maximum of three months. 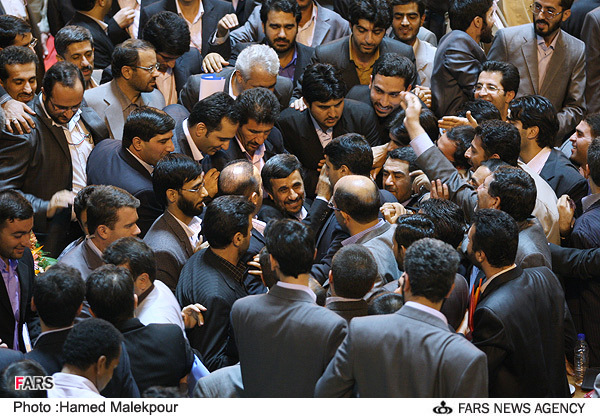 This development may signal a new round of acrimony between Mahmoud Ahmadinejad and the Majlis. Mottaki reportedly enjoyed broad support in the parliament and had been endorsed by Ayatollah Ali Khamenei in a televised meeting with the government on August 30. 'If Mottaki is replaced, the president should expect a strong reaction from the Majlis,' Mohammad Karamirad, member of the national security and foreign affairs committee of the legislature, had said around the same time. The president's office published a two-sentence decree appointing Salehi and a separate short letter thanking Mottaki for his service. No further information or explanation was provided in the statement. The dismissal appears particularly brusque since Mottaki is currently in Senegal, bearing a message from Ahmadinejad to President Abdoulaye Wade. Boroujerdi directed the reporter to contact Foreign Ministry spokesman Ramin Mehmanparast for more information. Updated 3:30 PM GMT, 8 December 2010. 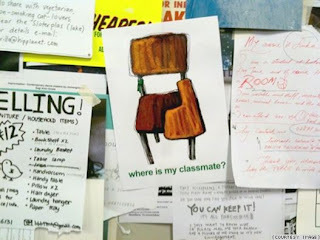 I have started compiling video, photos, and information concerning protests on Student Day, 7 December 2010, at 3:15 PM GMT. My aim is to give a raw idea of today's events. This should not be considered a live blog. I will update and bring a semblance of organization as the day progresses. A declaration demanding the release of all jailed students was read at a candlelight vigil at this university in southeastern Iran. The students also stressed that neither the threat of imprisonment, nor death, would diminish their resolve. The song, once again. Then, 'Students would rather die than be humiliated.' Notice security agent at 1:15, talking into a walkie-talkie as he climbs a light post. Later, 'Mir Hossein!' referring to Green leader Mir Hossein Mousavi. More footage of a few dozen Basijis staging a counter-demonstration next to the hundreds of green students. Various student sources report four arrests in Amir Kabir University today. 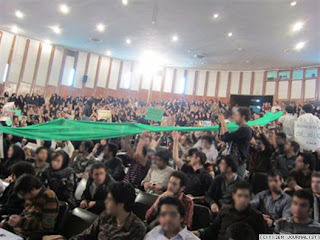 Bagheri and Zowghi (no first names available), members of the university's security forces, were particularly active in clashes against the students. Basijis prevented students from unfurling a poster of Majid Tavakoli, jailed student leader who was arrested here last year. Marg bar to, MARG BAR TO. Death to you, DEATH TO YOU! 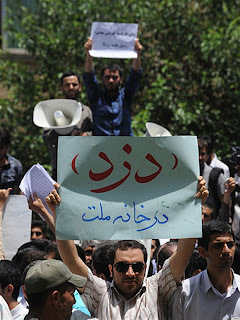 The demonstrators then chant, 'Honorable Karroubi, come to the nation's aid!' referring to Green leader Mehdi Karroubi. This slogan is followed by 'Coup government, this is your last warning. Iran's green movement is ready to rebel.' Security officers stand, arms folded, in front of the sit-in. The students take security officials to task for breaking up their rally. Security official: It is illegal. Young woman: Everything is illegal in this country. Young man: They've turned the university into an army barracks. Young man: The 16th of Azar (December 7) is not illegal. Young woman: Today is Student Day. It's our day. It's our day, mister. New video showing yesterday's protest. Technical College (photo courtesy Radio Farda). Photo could be of yesterday's protest. Candlelight vigil. One protester holds up a photo of slain student Kianoush Asa. Another shows a sign which reads 'Silence...' A third displays a photo of student Amir Javadifar, killed by torturers in Kahrizak detention center. And now a comic moment... Basiji rally attracts two dozen people, chanting 'Death to England!' and similar slogans, as students file past them without casting a glance. Yesterday, green students hijacked the screens of the computers in the common area. Demonstrators congregated in front of the IRI embassy in Greece and protested the presence of Foreign Minister Manouchehr Mottaki and the regime's oppressive acts, including the persecution of Iranian Christians. Student sources claim these photos are of yesterday's official ceremony in which protesting students chanted slogans and held up signs. 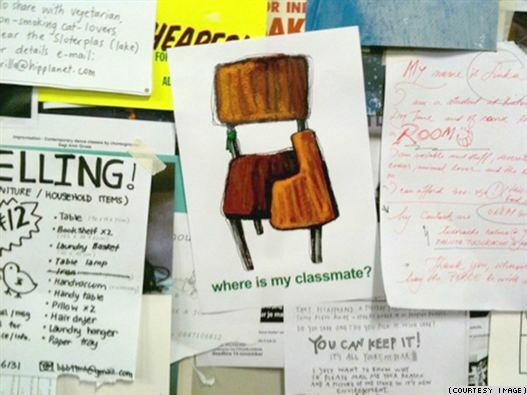 'A star in your file = the student's share of justice.' Stars are attributed to dissident students by disciplinary committees. Student reads flier with photo of Mir Hossein Mousavi. Students at Tehran University's Technical College defied a security clampdown to stage a protest on their campus on the eve of Student Day, according to videos posted on YouTube by Unity4Iran. Student Day in Iran, December 7, is different from International Student Day which takes place on November 17. 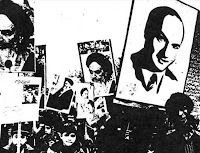 While celebrating student activism in general, the Iranian event is also a commemoration of the slaying of three Tehran University students by the Shah's police in 1953, shortly after the coup that brought Mohammad Reza Pahlavi back to power. 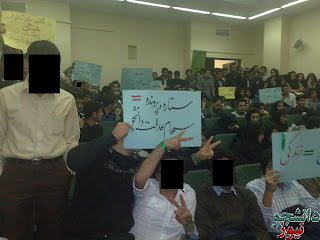 Students organized mass rallies against the regime on this day last year. (For a look at a live blog of December 7, 2009, please click here. For a detailed analysis of one video taken at Ghazvin University, please click here). Reports from Iran indicate that the regime has bolstered security in an effort to prevent similar incidents from occurring tomorrow. 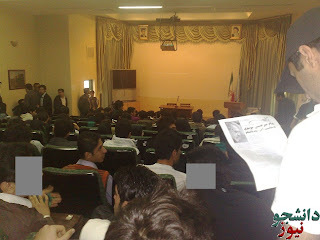 The following videos were taken at Tehran University at approximately 3 PM, 6 December 2010, Unity4Iran explained in an e-mail exchange. I originally wrote this article for Tehran Bureau. This is part 2 of a series of two articles, which explore whether Ahmadinejad is a religious fanatic or a populist. Or perhaps a mixture of both. For part 1, please click here. It was unlikely that Nabavi had chosen this last phrase by accident. 'Principlism minus the clergy' (osoulgarayi menhayeh rohaniyat) is clearly reminiscent of 'Islam minus the clergy,' a concept made famous by Ali Shariati, a prominent Islamic thinker and considered an ideologue of the 1979 revolution, even though he was at odds with the mullarchy and passed away in 1977 in Southampton, England, before the fall of the Shah. 'Theocracy is a system in which clerics, instead of politicians, assume political and governmental positions. In other words, theocracy is the rule of clerics over the nation. The natural outcome of such a [system] is despotism because the cleric considers himself the surrogate of God and the executor of His affairs on Earth,' Shariati wrote. In another instance, he wrote, '[In Islam], an organization known as the "clergy" does not exist and no one becomes a professional cleric. 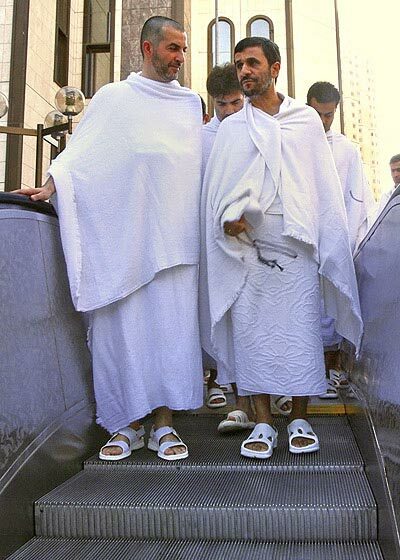 In Islam, there is no middleman between the people and God. Everyone is in direct contact with Him.' Supporters of the regime will of course argue that Iran is an Islamic republic and not a theocracy. In his interview with Panjereh magazine, Nabavi was issuing a warning against an idea -- 'Principlism minus the clergy' -- that, while not as extreme as 'Islam minus the clergy,' still had the potential to be immensely popular. So who are the 'deviants,' whom Nabavi spoke of, who would exploit this popular idea? One indication comes from an interview given by Deputy Minister of Islamic Guidance Mohammad Ali Ramin in September. 'Instead of being active behind the closed doors of political parties, NGOs, or other Western-style institutions, our clergy should return to their mosques,' said Ramin. He tempered his words by adding that he meant that the clergy could restore the central position of mosques in Iranian society and re-mobilize the vitality of the devout population which had stopped going to mosques. Ramin lived in Germany from 1971 until 1994, when he was deported, allegedly for his links with neo-Nazi and far-right parties. He was unknown on the national stage until Ahmadinejad's first term, when he became a presidential adviser, most notably contributing to the president's negationist positions on the Holocaust. He was the organizer of the infamous Holocaust Conference in Tehran, to which he invited old friends from Germany, including Benedikt Frings of the NPD (National Democratic Party). It is doubtful that he would have made the comments about returning the clergy to mosques without the consent of Ahmadinejad, who has yet to chastise him. Ahmadinejad's aides presented other novel ideas about Islam and Iranian society over the summer. 'There are many takes on the school of Islam, but our understanding of the reality of Iran and the reality of Islam is the school of Iran, and we must henceforth introduce the school of Iran to the world,' said Chief-of-Staff Rahim Mashai at a conference for Iranian expatriates in August. The identity and mythology of the regime is Islamic, the basis for its power has been Islamic, and here was a very senior government official touting the school of Iran (maktabeh Irani), and not even the school of Iranian Islam. The reactions from regime insiders were swift and unequivocal. General Seyed Hassan Firouzabadi, Armed Forces joint Chief of Staff said, 'We consider such words to be a deviation and a crime against national security and an attack on the values of the sacred regime of the Islamic Republic and the Islamic Revolution.' Regime officials almost always refer to the Islamic Republic and not the Islamic Republic of Iran. And therein lies the crux. 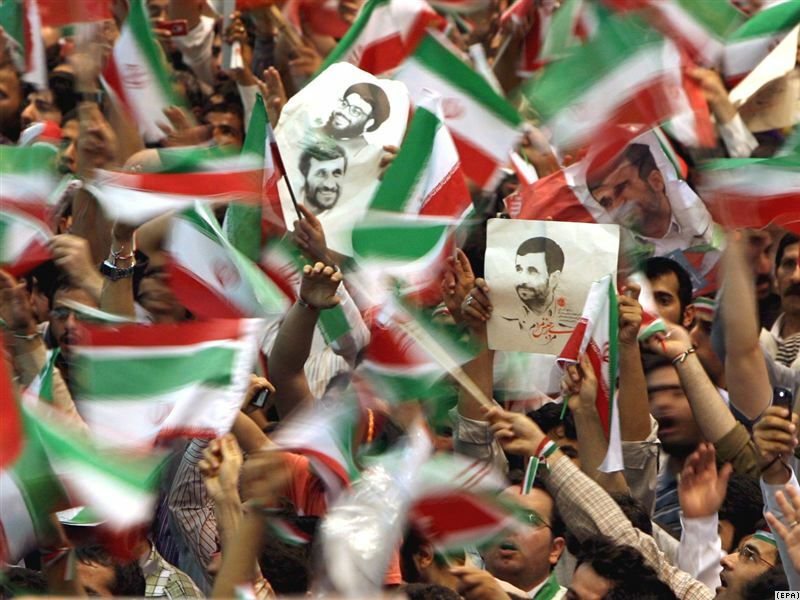 Nationalism and patriotism are extremely popular in Iran, perhaps more so than religion. Two of the most noteworthy slogans chanted in last years opposition demonstrations were 'Neither eastern, nor western, but an Iranian Republic' and 'Neither Gaza, nor Lebanon. I give my life only for Iran.' The patriotic song 'Ey Iran,' written in the aftermath of World War II, has long been a favorite of Iranians and it has become something of an opposition anthem in the past years. Is it an accident that Ahmadinejad's chief of staff has brought up the idea of a 'school of Iran' so soon after last year's unrest? Perhaps not. Not only has the president not disavowed Rahim Mashai's remarks, he has endorsed them despite the outcry by conservative clerics and regime insiders. 'What we say is very clear. the government speaks with only one voice. [Rahim Mashai] says the same thing, perhaps with a different vocabulary. Iran has had a singular role in developing a pure Islam. This is not nationalism,' he insisted at a press conference shortly after the incident. He maintained his support in a speech at last month's conference on 'Soft War' -- regime-speak for velvet or color revolutions -- held at Tehran University. 'There are many takes on Islam [...] in the world. 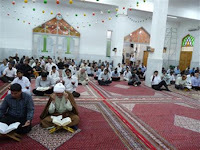 The understanding of Islam which is worthy of consideration for us has to be Iranian,' he told the participants. 'We believe Iran's culture and understanding of truth to be the closest to truth,' he added. Ahmadinejad's feigned crowd-pleasing statements, the Third-Worldism he shares with the likes of Hugo Chavez and Evo Morales, his attempts to gain a holy mantle, while tapping into quasi-reformation and anti-clerical ideology, and the appeals to the powerful social forces of nationalism and patriotism, give the appearance of a cynical, populist streak in the president. Whatever his plans, not many observers believe that Ahmadinejad will simply disappear from the political stage after serving his second term. The president is not the official head of any party, which would have allowed him to maintain a voice in the Islamic Republic's affairs. He seemed to be addressing this issue at the national gathering of representatives of the Supreme Leader in July when he stated, 'The velayat and the revolution have but one party and that is the velayat party and God's party.' Velayat can be a reference to the Supreme Leader or the rule of the Imam Zaman. 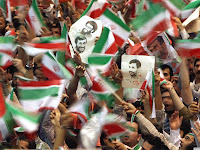 In both cases, Ahmadinejad may believe that he can occupy a central position within such a nebulous entity at the expense of the established groups. Certainly, the quick reactions of various political figures showed that that was their interpretation of the president's words. 'The velayat party has no basis in reality and the Imam [Khomeini] and the Supreme Leader have not referred to it even once. [...] Some people are creating disturbances among Principlists and we must be aware of this,' Islamic Coalition Party chairman Mohammad Nabi Habibi was quoted in Khabar Online, a news site close to Majlis Speaker Larijani. The president may be taking concrete steps to place his ideological stamp on the regime. In August, Jahan News reported that a 'Principlist manifesto' (Ahmadinejadism?) was being drafted and that it would soon be submitted to Ahmadinejad. 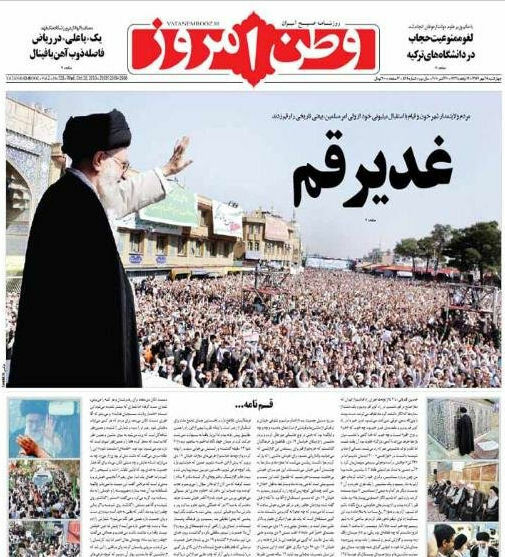 'This manifesto, which will provide a clear description of Principlism, will restrict the scope of Principlism to such a degree that individuals such as [Tehran mayor] Ghalibaf and [Majlis Speaker] Larijani will no longer be considered Principlists,' wrote the news outlet close to the intelligence unit of the IRGC. (Ghalibaf and Larijani also ran in the 2005 presidential election, but failed to make it to the second round.) Majlis representative Ali Motahari reached the same conclusion in an interview with Aftab daily, accusing 'Principlist extremists' of devising the manifesto in order to eliminate Ahmadinejad's rivals. Motahari surmised that certain Principlists were taking this step in order to prepare for the next elections. 'It is a pity that the presidency only lasts two terms, because Ahmadinejad's record in this term has been much better than the previous one,' said Mohammad Javad Larijani, Khamenei's adviser and head of the human rights commission of the judiciary, in May. Whether Larijani was attempting to gain the support of the president's loyalists for his brother, Speaker Larijani, or whether he was putting on a show of impartiality, the statement did provoke some discussion about a possible amendment to the constitution. If Khamenei were to consider such an amendment to be expedient, it is quite possible that it would be railroaded through the legislature and Guardian Council. In other words, a former president who has served two terms can run again after a lapse of one term. That is why Mohammad Khatami was able to consider (and reject) becoming a candidate again in 2009 and Ayatollah Ali Akbar Hashemi Rafsanjani ran in 2005 even though he had already served two terms in the 1990s. Some analysts believe that Ahmadinejad may attempt a 'Putin-Medvedev shuffle.' Former Russian President Vladimir Putin handpicked his successor, Dmitry Medvedev, in 2008 when he faced the same type of constitutional restriction. He subsequently became the prime minister and is expected to run for president again in 2012. There have been persistent rumors that Esfandiar Rahim Mashai, whose daughter happens to be married to Ahmadinejad's son, would play the Medvedev role in the Iranian scenario. As explained previously, Rahim Mashai is not popular among many conservative clerics and portions of the Principlist camp, who managed to convince Khamanei to block his nomination to the post of First Vice President last year. Ahmadinejad enraged his rivals by quickly naming him as his chief of staff, which could not have occurred without the acquiescence of the Supreme Leader. This suggests a certain symbiotic relationship between the president and Khamenei, each considering the other as necessary to advance their own goals. It would not be outlandish for Khamenei to accept Rahim Mashai in the highest elected office of the land. 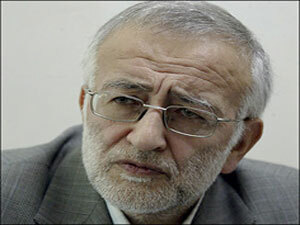 He is one of Ahmadinejad's closest aides who has voiced many of the same populist positions as the president. He is considered more amenable to some reformist demands and maintains ties to the trendy artistic community. He could therefore bring some of the opponents of the regime back into the fold. If he were to become president, Khamenei would be able to maintain the delicate, yet tense, balance within the power structure and regain some luster as an arbiter. Beyond the official political organizations, Rahim Mashai can also count on the support of the President's Young Advisers, a broad network of up-and-coming activists present in various ministries, presidential offices, and provincial governments. Rahim Mashai happens to head this group, one of the dozen or so functions that he fills in the administration. 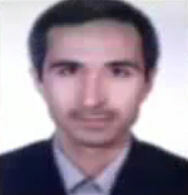 Before the summer, he named Abbas Masjedi as his plenipotent representative within the group and instructed him to 'expand the Young Advisers network throughout all ministries, independent organizations, vice-presidential offices, and provincial governorships by the end of the [Iranian year],' according to the Ahmadinejad administration's news outlet. The president and Rahim Mashai received a rousing welcome at the 4th Conference of Young Advisers on October 10. And while Ahmadinejad and his supporters have advanced their agenda, they have continued to confront their rivals, not only among the Greens, but within the Principlist camp itself. Speaker Ali Larijani has been the main target of such attacks, which have splintered the Principlist faction in the legislature and managed to erode his support within the Majlis. Not only did Ramin refer to Khamenei as Imam, rather than Ayatollah or Supreme Leader, but he compared him to one of the most inspirational figures of Shiite Islam, Imam Ali. It was at Ghadireh Khom or the pond of Khom that the Prophet Mohammad appointed Ali, his son-in-law, as his successor in 632 AD. But what was on Khamanei's mind as he arrived in Ghom and gave his first speech? Real Arab support for Iran war or "possibility of a disinformation campaign"
Paul Jay, senior editor at the The Real News Network, sat with Lawrence Wilkerson, former chief of staff of Secretary of State Colin Powell, to discuss references to Iran in the cables divulged by Wikileaks, particularly the alleged calls by Arab leaders to attack the Islamic Republic. An Iranian nuclear scientist was killed and another was slightly injured in separate bomb attacks as they drove to work in Tehran early Monday morning, November 29. Reports of a third explosion in the Mahalati district, northeast Tehran, were not confirmed by police sources, according to Mehr News. In both incidents which took place between 7:30 and 8:00 AM, motorcyclists attached explosive devices to the victims' cars in morning traffic, before fleeing the scene. Dr. Majid Shahriari, an elementary particle physicist and a member of the scientific board of Beheshti University, died in the blast that tore through his automobile near the intersection of Imam Ali and Artesh freeways. His wife and driver were wounded in the attack. Artesh Freeway runs south of the Mahalati district and it is unclear whether the sound of the conflagration that killed Shahriari was the source of confusion about a third attack in that district. Dr. Fereydoun Abbasi Davani, an assistant professor of nuclear engineering at Beheshti University and an expert in lasers, and his wife were lightly injured in the explosion that blew off the driver's door of their car in a square near Beheshti University in the Velenjak district. 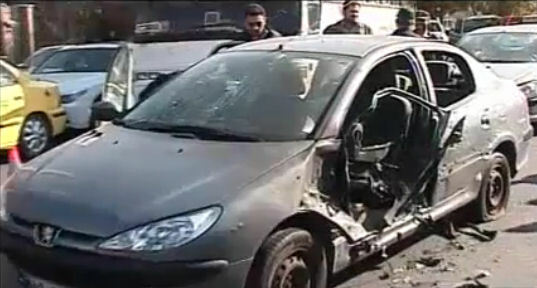 They dashed out of their Peugeot seconds before the device exploded, an eyewitness told the Islamic Republic of Iran Broadcasting corporation (IRIB). 'I was behind the damaged car. I saw the car stop and the driver jump out. He ran to his wife's side and got her out as well. They were two meters away from the automobile, when it blew up,' said the eyewitness to IRIB's Channel 1 news. Abbas Davani and his wife were treated for their wounds at Taleghani Hospital, less than a mile from the attack, and released shortly before noon. The public relations office of the greater Tehran police force declared that both spouses of the nuclear scientists also worked for Beheshti University, although it did not explain in what capacity. 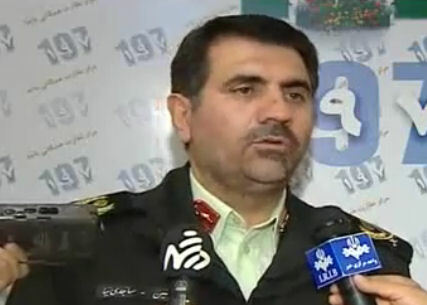 General Hossein Sajedinia, commander of greater Tehran's police force, told reporters that no group or individual has taken responsibility for the terrorist acts and that no suspects were in custody. He denied previous reports that a Peugeot 206 had been involved in the attacks and had been pursued and shot at by the police in the vicinity of Beheshti University. However, he attributed the criminal acts to 'lackeys of the Zionist regime.' Media outlets have echoed such sentiments, adding Britain, the United States, and the MKO to the list of suspects. 'Both attacks were carried out by motorcyclists who, according to witnesses, attached the explosive devices to the cars with magnets. The bombs exploded a few seconds later,' he added. Another nuclear scientist, Dr. Massoud Alimohammadi, was killed by a bomb attached to a motorcycle outside his Tehran home on January 12. The device was detonated by remote control as Alimohammadi left for work. The Islamic Republic blamed foreign governments and banned opposition groups for that attack, but Alimohammadi's involvement in the country's nuclear program is far from established and it has been revealed that he was a supporter of Green leader Mir Hossein Mousavi. 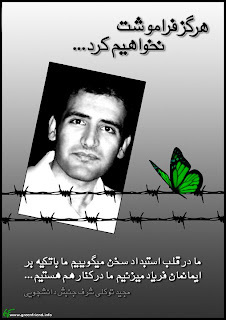 Alimohammadi knew both scientists who were targeted today. 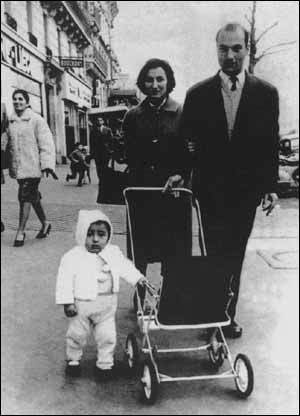 Shahriari was one of two Iranian advisers (Dr. Javad Rahighi was the other) on the Sesame Project, which stands for 'Synchrotron-light for Experimental Science and Applications in the Middle East,' an international scientific project under the auspices of UNESCO. Alimohammadi was one of the Islamic Republic's two official representatives on the project. Dr. Babak Shokri, the other official representative, and Rahighi are the surviving members of the initial four-man team. Fereydoun Abbasi Davani and Alimohammadi were both non-resident researchers at the the Institute for Research in Fundamental Sciences (NB Pajouheshgah Daneshhayeh Bonyadi, also knows by its acronym IPM, which stands for the Institute for Studies in Theoretical Physics and Mathematics). The two scientists were allegedly colleagues at Imam Hossein University, which is divided into two institutions, one for training officers of the Islamic Revolutionary Guards Corps, and the other which is open to the general public. Finally, Alimohammadi and Abbasi Davani have both been linked to the Institute of Applied Physics (IAP), which reportedly conducts research for the Islamic Republic's nuclear program. 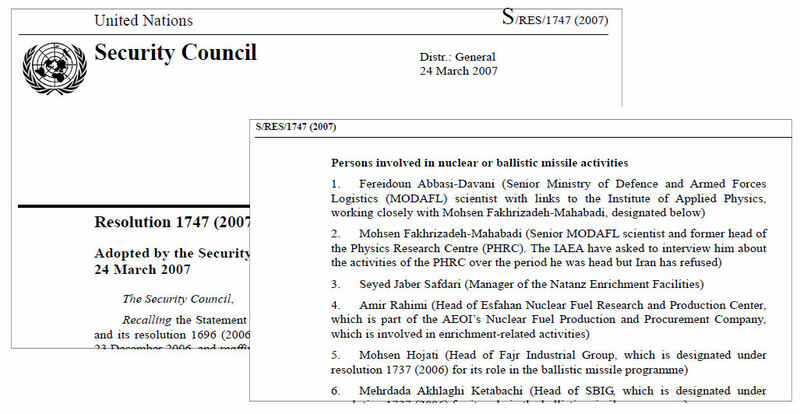 Though proof of Alimohammadi and Shahriari's alleged ties to Iran's military nuclear program and the regime is tenuous, there were sufficiently compelling indications to place Abbasi Davani under international non-proliferation sanctions as a person 'involved in nuclear or ballistic missile activities.' He appears in Annex I of UN Security Council Resolution 1747, which was adopted on 24 March 2007 and calls for member states to freeze his assets and exercise vigilance in allowing him to enter or transit through their territories. Abbasi Davani has been a member of the IRGC since 1980 and saw three tours of duty during the Iran-Iraq war, according to Mashregh News. Aty News, close to the regime, reports that he teaches at the Superior National Defense University. He reportedly runs the physics program at Imam Hossein University, where he works closely with another Guardsman and physicist, Mohsen Fakhrizadeh Mahabadi, who is also under UN sanctions. 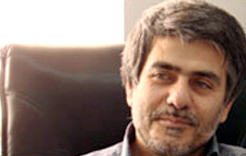 Abbasi Davani was honored by Mahmoud Ahmadinejad at an awards ceremony for 21 top academics in 2007, according to Ebtekar News. In October of this year, he was one of sixty award recipients at a ceremony marking the 50th anniversary of the creation of Beheshti University (formerly National University, Daneshgaheh Melli).